Trash in Japanese is called gomi, and each city and each town and each district has a different system for collecting garbage in Japan. Each district has its own gomi guide to refer to for the different procedures. 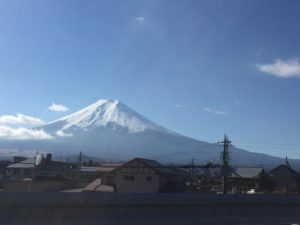 For the purpose of this article, since I will be living in Fukuoka, I will be going over the rules and regulations from the Fukuoka gomi guide. All pictures are captured from the Fukuoka gomi guide as well. Here in America we simply recycle or throw away certain materials we no longer need or wish to use any longer. However, in Japan it is not that simple. 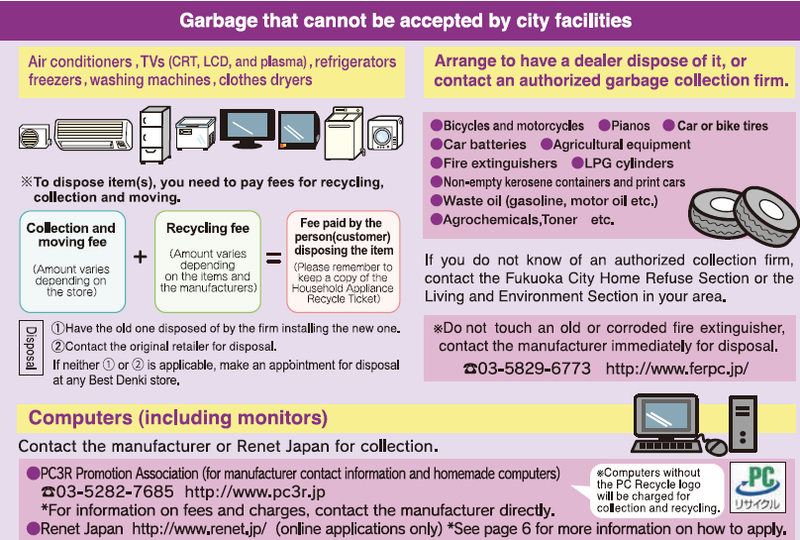 In Japan, everyone must sort their garbage into burnable items, non burnable items, and recyclable items and put the collected garbage into color-coordinated bags which are specific to each district and are sold at local convenience stores. 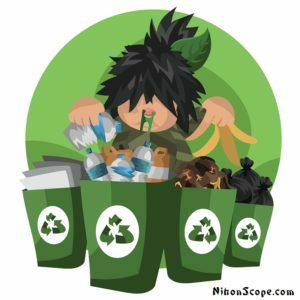 According to Waste Atlas each person in Japan produces an average of 356.2kg of waste per year and as a whole, Japan generates 45,360,000 tons of municipal waste per year, ranking 8th in the world. They have special machinery to help burn items that normally are difficult to burn that is also cheaper, takes up less space, and produces fewer nitrogen oxides and less sulphur dioxide than typical incinerators. They also convert the fumes produced when burning into energy which fuels the machine itself as well as generates power for the local area. 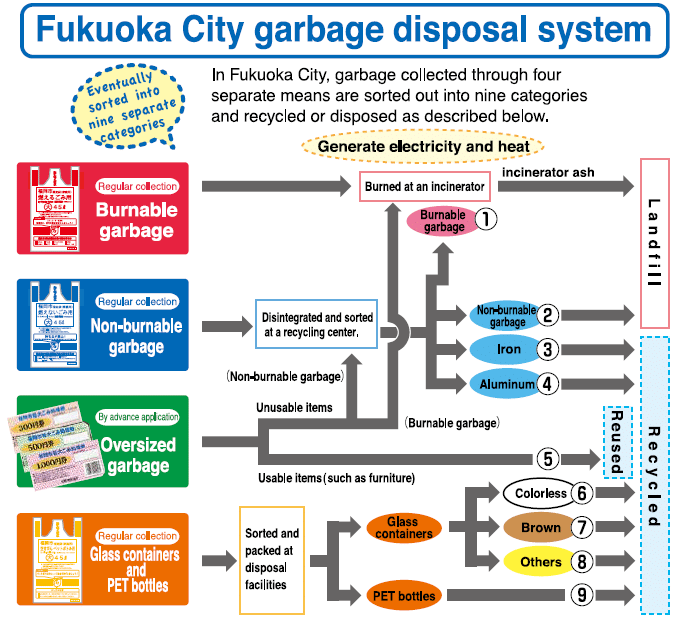 According to the Fukuoka City Garbage Disposal System Pamphlet, four incinerators can supply power to 33,660 households in the surrounding area. Although the colors are the same nationwide, the specific bags for each district are labeled with the name of the district on each bag. Red bags indicate burnable items, blue bags indicate non-burnable items, and white bags are for recyclable items. Each person must also put their name or code on each bag to indicate who to return the garbage to if it is improperly sorted. If someone wishes to get rid of an item that does not fit in the specified bags, they will then have to purchase a disposal ticket priced equivalent to the weight and size of the item and attach the ticket with their name to the item and leave the item at a designated pick up location. If the item is in good condition, the item may be sold for reuse. The Japanese have a phrase, “mottainai” which means “What a waste” or “waste not, want not” to try and help primarily reduce the amount of waste including food waste and secondly reuse items before recycling or wasting. What about air conditioners, TVs, refrigerators, freezers, washing machines, clothes dryer, and computers? For these specific items, there will be a collection and moving fee plus a recycling fee, and people have to call and authorized collector to handle these specific items. People also have to call an authorized collector to dispose of bicycles and motorcycles, pianos, tires, car batteries, agricultural equipment, fire extinguishers, LPG cylinders, non-empty kerosene containers and print cars, gasoline and motor oil, and other agrochemicals like toner. Burnable items include kitchen waste, non-recyclable plastic, rubber items, leather items, bamboo or wooden items, entirely empty disposable lighters, disposable diapers, pet excrement, empty kerosene tanks, clothes and futon mattresses, cold packs and paper trash and tin foil. There are certain conditions and requirements for certain items, but I don’t know how strictly these requirements are enforced and how strictly people abide by the requests. The collection agencies ask people to remove any excess water from their food waste to prevent odors as well as unnecessary weight and mess. They also ask that cooking oils be chemically coagulated or absorbed completely with paper towels. 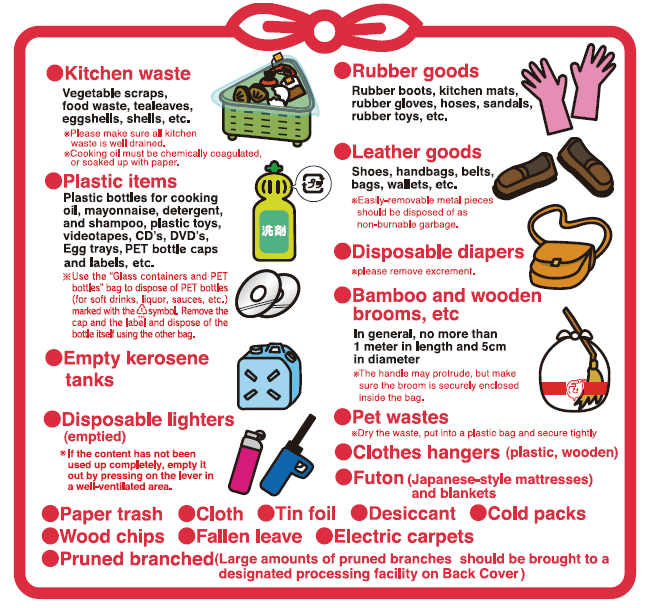 Non-recyclable items include plastic bottles for cooking oil, mayonnaise, detergent, and shampoo, plastic hangers, toys, videotapes, CD’s, DVD’s, egg trays, PET bottle caps and labels. Rubber items consist of Rubber boots, gloves, sandals, toys, hoses, and kitchen mats. Leather items consist of leather shoes, handbags, belts, bags, wallets, and other leather items. If a leather item (like a belt) has metal, the metal should be removed and disposed of in a non-burnable garbage bag. For bamboo and wooden items, they should not be bigger than 1 meter in length and 5cm in diameter and should fit in the bag without causing the bag to tear. In disposing of a wooden broomstick, the handle may stick out of the top of the bag as long as the rest of the broom is secure inside the bag. For disposal of tree branches, it is requested that large amounts are brought to a designated processing facility. Disposable lighters must be entirely empty which can be made certain by pressing on the lever. In disposing of disposable diapers, collection agencies request that excrement be removed before disposal. Pet waste is asked to be dried and secured tightly in a plastic bag. 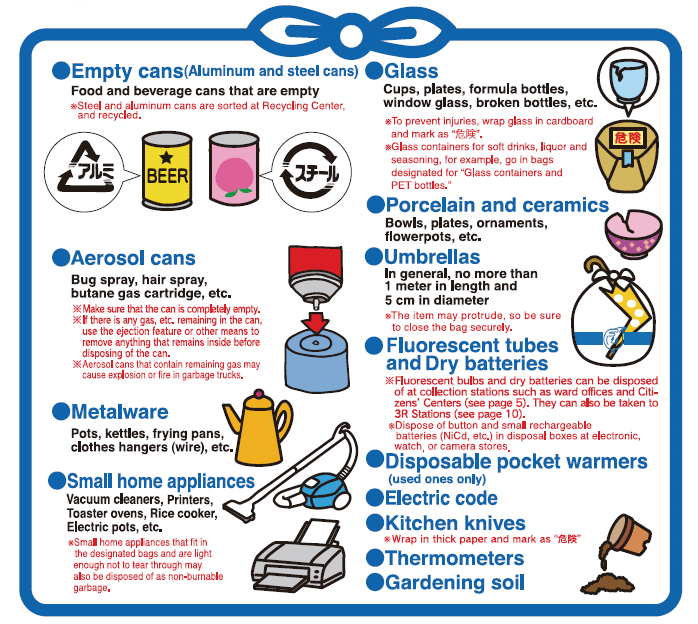 Non-burnable items consist of aluminum and steel cans, entirely empty aerosol cans, metal pots and pans, metal items like hangers and wire, small appliances, glass, porcelain and ceramic, umbrellas, fluorescent tubes and dry batteries, disposable pocket warmers, kitchen knives, thermometers, and gardening soil. Steel and aluminum cans are sorted and recycled. To make sure an aerosol can is entirely empty you can remove the push cap so that there is just the small tube and press the small tube against the center spot of the top of the container lid. Small appliances that are accepted as long as they fit in the designated non-burnable bag are: vacuums, printers, toasters, rice cookers, and electric pots. Glass cups, plates, formula bottles, medicine bottles, window glass, vases, aquariums, ashtrays, ornaments, light bulbs, opaque white and broken bottles are disposed of as non-burnable items. Glass containers for soft drinks, liquor, seasoning, cosmetics, and food (like jam jars) are to be disposed of in the recyclable bag designated for PET bottles and glass containers. If someone is disposing of broken or sharp glass, it should be wrapped in cardboard and marked. Porcelain and ceramic bowls, plates, ornaments, and flowerpots are disposed of in non-burnable designated bags. The same requirements for disposing of a burnable wooden broomstick apply to umbrellas. The handle of an umbrella may protrude out the top of the designated non-burnable bag, but it is requested that umbrellas not be longer than 1 meter in length and 5cm in diameter. Fluorescent bulbs and dry batteries can be disposed of at collection stations such as ward offices and citizens’ centers or taken to 3R stations. Kitchen knives should be wrapped in thick paper and marked the same as broken glass. People are asked to recycle small household electronic items such as cell phones, cameras, game consoles, music players, chargers, remote controls, electric cords, and other electronic accessories and devices by dropping them off at collection boxes located in ward offices and supermarkets. Japan recycles paper, metals, glass, and plastic. Most of the plastic in Japan that is commonly recycled are PET bottles which are recycled into new PET bottles and also clothes, bags, carpets, and doggy raincoats. 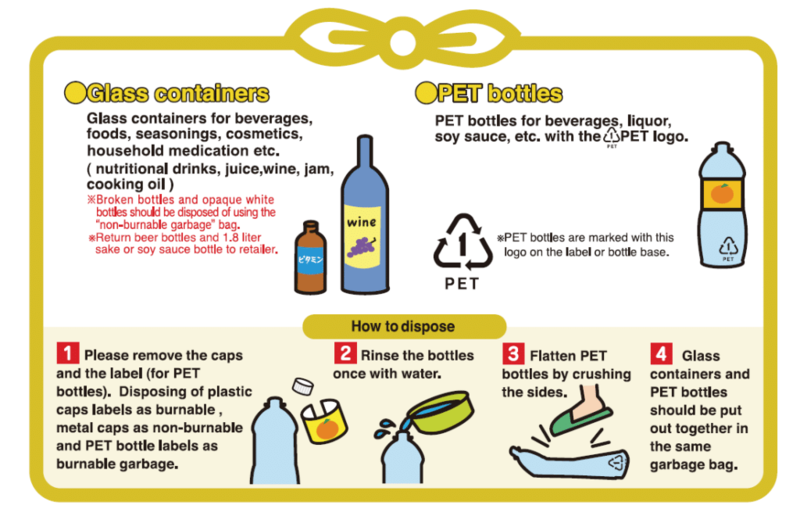 In order to be recycled, PET bottles should have the label removed as well as the cap and should be rinsed out and smashed. Newspapers should be neatly stacked and bundled with twine. Flattened cardboard should also be neatly stacked and tied with twine. Small papers can be collected in paper bags. Paper coated with plastic, or water proof paper, or paper drawn on by crayons, or paper with paint on it, or scented paper, or carbon paper, or self-adhesive envelopes and post cards are not accepted as recyclable paper. Paper cartons should be flattened and rinsed and can be recycled. Food trays that are thin enough to be poked with a toothpick can be washed and dried and recycled. Commercial garbage should be separated from residential garbage. If someone voluntarily cleans up leaves or trash in a public place, they can have the city collect the garbage if they contact the local ward office. 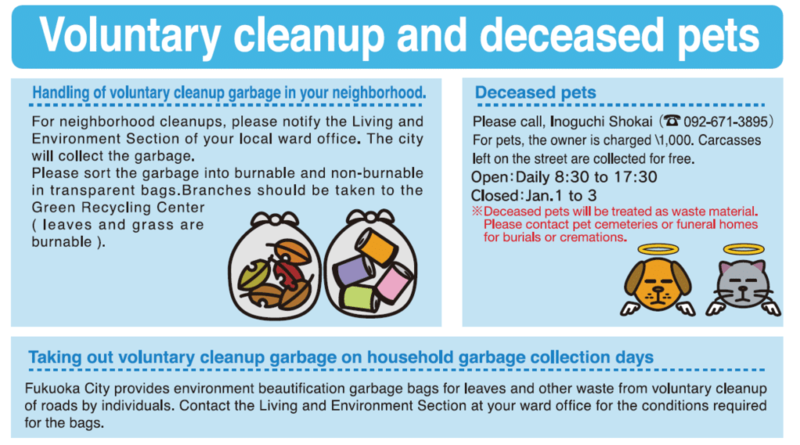 Deceased pets can be disposed of as waste material for a 1,000 yen price tag, or they can just leave their dead animal on the street to be collected for free, or people can contact pet cemeteries and funeral homes for burials and cremations.